* Back in 2002 Ruy Teixeira and John Judis wrote, “The Emerging Democratic Majority,” which argued that demographic trends over the next several decades were set to heavily favor the Democratic Party. It all looked very prescient when the Obama coalition emerged, but major questions arose with the election of Donald Trump. Recently, Judis wrote that they were wrong and suggested that it was time to redo the math. But Teixeira stuck to his guns. Based on recent wins for Democrats last month and yesterday in Alabama, Ron Brownstein weighs in with something that sounds an awful lot like the original argument made by Judis and Teixeira. * Philip Bump shared some data on the groups that are shrinking as well as the ones that are growing. 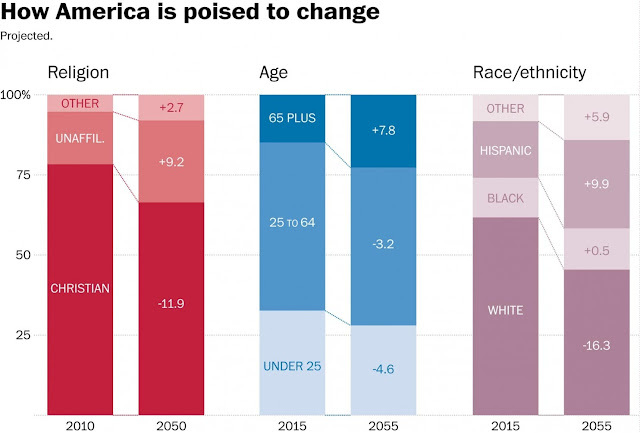 Older — but less white and, importantly, less religious. In other words, it will in significant ways look much less like the voters who supported Roy Moore than those who supported the Democrat, Doug Jones. * To those who suggest that the DNC needs to change, I would say that it already has. The DNC’s work in Alabama included over 1.3 million phone calls, 1 million text messages to voters and volunteers, and 325,000 door knocks, according to the official. In addition to distributing a mailer focused on voting rights, the national committee’s forces also organized vans to deliver college students to voter registration offices and then to the polls. * It wasn’t that long ago that Steve Bannon was being hailed as the new Pied Piper of the Republican Party. Regardless of whether he deserved the title, the insurgents in that party were clearly dominant in their civil war with the establishment. Yesterday’s defeat of Roy Moore has reignited the establishment – like the editorial board at the Wall Street Journal. * Speaking of editorial boards, someone lit a fire under the folks at USA Today. …as is the case with all of Trump’s digital provocations, the president’s words were deliberate. He pours the gasoline of sexist language and lights the match gleefully knowing how it will burst into flame in a country reeling from the #MeToo moment. * Finally, this song goes out to Doug and Louise Jones, who celebrated their 25th wedding anniversary yesterday.